Coldwell Banker Commercial Benchmark: Will Jacksonville Apartment Property 2014 Operating Performance Beat the Bar Set in 2013? 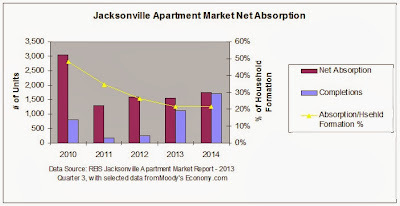 Will Jacksonville Apartment Property 2014 Operating Performance Beat the Bar Set in 2013? 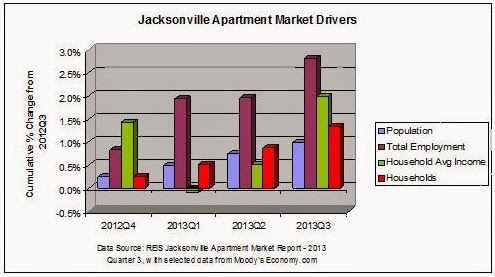 2013 is shaping up to be a very good year for Jacksonville apartment properties. As discussed in previous posts: vacancies are down, effective rents are up, and operating expenses are under control. Let the good times roll! But, will they roll into 2014? That obviously depends on what is going to happen with the drivers that have created those good times. From previous posts, you know that an improving employment picture has increased household incomes and thus released pent-up household formation (see Figure 1). After a hiccup in household income growth in 2013Q1, incomes resumed growing in 2013Q2 giving consumers the confidence to begin forming new households at a pace exceeding population growth. Both resurgent job and resulting income growth in 2013Q3 fired up the household formation rate while population growth remained steady. The combined rising household formation rate and household incomes had two positive benefits for landlords (see Figure 2). Rising household formation created the demand for housing units that brought vacancies to a level 150 BPS below Jacksonville’s ten-year average vacancy rate. That demand level allowed landlords to raise effective rents in pace with rising average household incomes (see Figure 2 Effective Rent as a percent of Average Household Income). Given relatively stable operating expenses, improved revenue could go to straight to NOI. However, that entire revenue enhancement occurred in an inventory-constrained environment. From 2010 through 2013Q3 new apartment inventory completions were minimal relative to demand (see Figure 3). Starting in 2013Q4 and continuing into 2014 the supply situation will change dramatically. In 2013Q4 570 units should be completed, doubling the completions for 2013 to date and more than double the combined completions in 2011 and 2012. REIS projects that 1,708 units will be completed in 2014, 50% more than the number of units completed in 2013. So what will happen in 2014? That brings us back to the demand drivers: employment growth resulting in rising household incomes fueling household formation and rent paying capacity. The On Numbers Economic Index produced for American City Business Journals is an index designed to show the relative economic strength of the 102 major metros with estimated populations exceeding 500,000. As reported by the Jacksonville Business Journal, in January 2013 Jacksonville ranked 98th rising to 16th in September; but falling back to 42nd by November. That still suggests a relatively strong local economy. The Local Economic Indicators Project (LEIP) at the University of North Florida produces a Local Leading Economic Indicator Index for Jacksonville: it has risen from 111.08 for January 2013 to 114.09 as of October, although they expect it to decline slightly going into the new year. Nevertheless, LEIP expects Jacksonville to outperform the national economy, At this time it is therefore reasonable to expect sufficient demand to maintain vacancies and effective rents at current levels even with new completions increasing the inventory (i.e., forgetting for the moment all the exogenous potential disruptions like the federal budget deficit, Obamacare, war in the Middle East or with China, etc.). Reinforcing sustained demand for apartments, there are mitigating forces to any decline in employment growth. 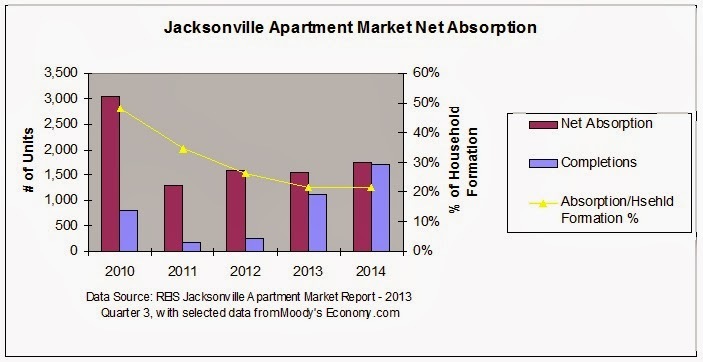 Apartment absorption has been a declining percentage of new household formation (see Figure 3). Any decline in employment growth with a resulting decline in household incomes would direct demand towards apartments from home purchases. Also, home ownership affordability is declining as evidenced by the NAHB/Wells Fargo Housing Opportunity Index and the National Association of Realtors First Time Homebuyers Affordability Index for existing homes. Thus, strong apartment operating fundamentals should continue, but not improve, into 2014 even with the increased inventory hitting the market. HOWEVER, there is a caveat for existing properties. It will be a much more competitive market in 2014. You can no longer sit back and count on rising household formation and incomes to fill units and raise rents. Older properties need to be fresh and targeted to their specific market to compete as competitors seeking to maintain their occupancy in the face of increased competition pursue existing residents.